Several times a year, we meet people working in large organizations who have never been informed of the new possibilities of using neurosciences when conducting user tests. Quantitative tests, whose representativeness allows for an exact and precise research, based on a large number of testers. 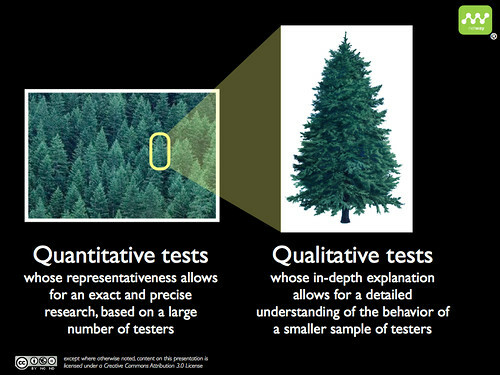 Qualitative tests, whose in-depth explanation allows for a detailed understanding of the behavior of a smaller sample of testers. The origins of the current studies and techniques can be found in the marketing world and we see that their use in the digital world doesn’t provide the whole picture. The so-called projective qualitative techniques: open analogies, Chinese portraits, role-playing, imaginary constructions, … with the aim of putting the imagination and the creativity of the participants to work. All these techniques interrogate the 5% of cerebral activities of a participant that are conscious. In other words, with these techniques, participants are asked to use the zone of their brain that is responsible for high-level thinking. 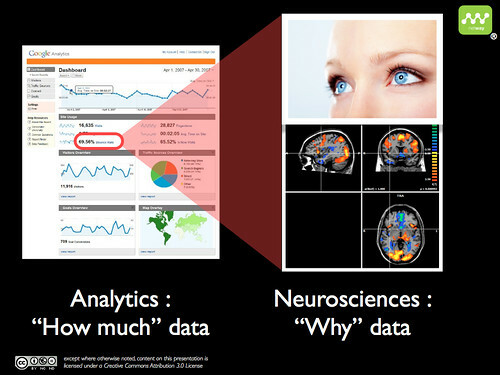 Neurosciences can offer an answer to these questions. The fundamental principle of neuro-scientific tests is to measure what a facilitator or a human observer is unable to pick up: the real behavior of participants. This can be compared to the Pareto principle: 80% of the traditional techniques used to evaluate screens can only collect 20% of the real use. 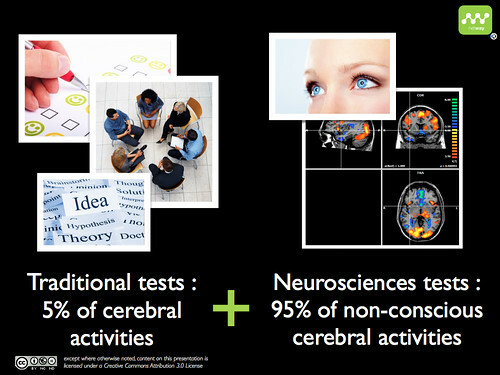 The 20% of tests based on neuro-scientific techniques can measure 80% of the behavior. User statistics are excellent indicators to measure the behavior quantitatively but of course, this requires the site to be online. Predict the behavior on a screen. Which track do users follow? Which zones draw the attention of users? Which zones are looked at by users? How do they analyze/understand the zones they look at? What is the level of complexity of the analyzed zones? Which emotions do the zones generate? What is the level of commitment in relation to the different zones? Which zones make the users act? Which zones are memorized/remembered by users? What do users verbally say about the zones? My team has put together a list of 63 different indicators to answer these questions. With advanced eye-tracking, we can measure 16 indicators (most eye-tracking analyses in the market only use 2 or 3 basic indicators). The 47 other indicators use neuro-scientific techniques, including functional MRI.